Human beings are weak on every sense and they need of a superior force to transcend this valley of tears. It is a sign of pride to even think this is work we can do by ourselves. We all need of divine help, symbolized here as the fertilizing rain. Regent God: This is the liquid nourishment of life, the duality with the Sun. 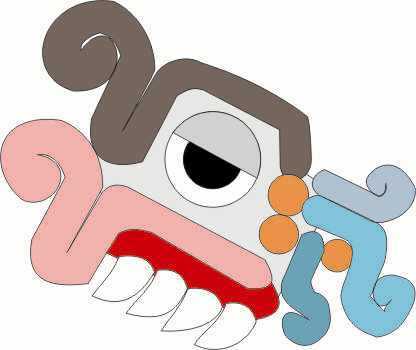 Quiahuitl is the eighteenth sign and is represented by the head of Tlaloc (God of Rain) or by the elements that make up his countenance, his face. In this representation we see blue around his eye, a blue stripe that wraps around one of its two sides and adorns the upper lip; long teeth and a bun on his head divided in white and green segments. The Location of the Day in the Borgia Codex: Appears on his dart thrower, showing that these are forces that come from divinity, that we are not alone performing the work.